Because of the controlled nature of soilless gardens and the ability to grow either indoors or outdoors, there are far more plant options for you to choose from. Different hydroponic plants do however, grow better in different hydroponic systems. Here’s a look at the different types of hydroponic plants you may want to consider as well as the method or system they seem to best grow in. If your system if vertically oriented then vine plants like tomatoes or strawberries grow ideally as long as they are given the proper support with stakes or cages. Hydroponic lettuce grown in net pots with clay pebbles using the deep water culture method. Image via oocities.org. Horizontal systems are more conducive to plants like lettuce, radishes, and carrots. Cucumbers and other salad greens however, can also be grown vertically. Lettuce is actually an ideal hydroponic plant because it’s lightweight and its root systems are not large, therefore the plants can float using the nutrient film technique. 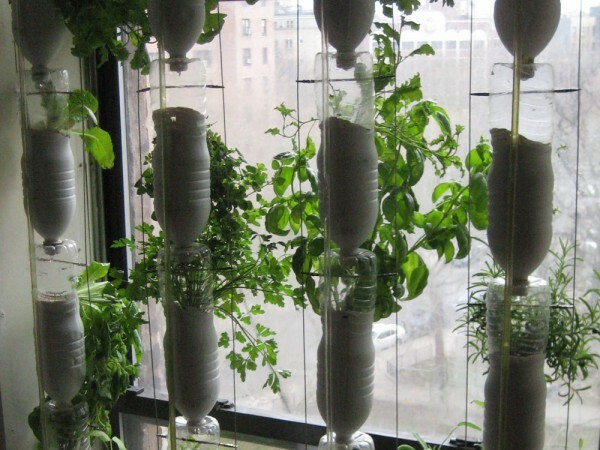 Window farming – growing your own herb garden in your window space. Image via windowfarms.com. These plants do not bear any fruit and therefore do not need their weight supported by stakes. Because these plants generally don’t take up much space, it’s quite easy to create your own simple DIY hydroponic herb garden using recycled bottles with any type of soilless grow medium. A basic drip system works well. Of course the important thing to remember is how much space you have to work with. Assess your positioning near your windows and measure out how much space you can give up. You should then determine how much you actually want to yield from your plants. Families will need to grow multiple plants and individuals will require fewer plants. So as to avoid food waste, we recommend starting with fewer plants and then adding more if need be. What fruits, vegetables, or herbs have you grown hydroponically and what type of system have you found works best? Send us your system here. Feature Image: Fresh salad ingredients. Image via mollotchka.blogspot.ca.